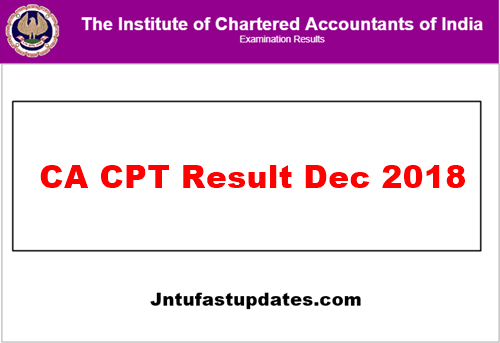 CA CPT Result Dec 2018: Institute of Charted Accounts of India (ICAI) has declared the notification to announce the CA CPT December 2018 results. As per the announcement, the ICAI is slated to release the result on 23rd January 2019. All the competitors who have clashed for the CA CPT (Charted Accountancy Common Proficiency Test) exam on 16th December 2018 can wait to download CA CPT Result 2018-19. The result will be accessible on ICAI website, icaiexam.icai.org. Aspirants can visit the website to get the result. On the homepage of the portal, the result link will be activated. By just clicking on the link, the competitors will be able to download CA CPT December 2018 result. The result will be accessible namewise, numberwise, regionwise. Candidates can check the result in their desired format. CA CPT Results 2019: Institute of Charted Accounts of India (ICAI) conducted the CA CPT exam on 16th December across India in many examination centers across the nation. A huge number of competitors have appeared for the exam this year. The hopefuls who have appeared for the CA CPT Exam and waiting for the result can wait till 23rd January 2019 to check the result. ICAI CA CPT Result, toppers list/merit list, and score will be announced at a time. Students can check CA CPT results namewise, numberwise, center-wise and regionwise. Also, the result will be available to check in various formats of through email, SMS, and online. Students who have come across ICAI CA CPT Exam can check the following methods to download the result and much more information from the following article. Students can download ICAI CPT Result through the following ways. icaiexam.icai.org – Visit any of the portals. Press enter and your result will be displayed on the screen. Check CA CPT Result, score and take a printout for reference. nic or icai.nic.in – Visit any of the portals. A link for Email registration will appear on the screen. Tap on ‘Register me’ button. Now, the user registration will be done and the user can be able to download the result on their email id. Note: The Email registration process will be starting from 19th January 2019. For CPT Result 2018: CACPT (space) Six Digit Roll Number. For CA Foundation Result: CAFND (space) Six Digit Roll Number. Help Line Telephone Numbers 0120 3054 851 / 852 / 853 / 854 / 835 OR 0120 4953 751 / 752 / 753 and 754. Email ID For CPT – cpt_exam@icai.in | For Foundation – foundation_examhelpline@icai.in. All the competitors who have competed for CA CPT Examination and cleared the test will get the rank card and marks sheet. Which is going to be available after 2 weeks of the result declaration. Candidates who passed the CPT exam with more than 70% of marks will get “Pass with distinction” certificate along with the marks sheet. In any case, if anyone lost their marks sheet, they can again obtain it by following the steps given below. Month and year of appearance. Students competed for the CA CPT Examination in the month of December 2018 need to score the specified cutoff/qualifying marks to clear the examination. Candidates have to score at least 40 marks in each section and 50% above on aggregate to clear the CPT examination.